ZACK SMITH PHOTOGRAPHY - Want to Improve Your Instagram Photography ? 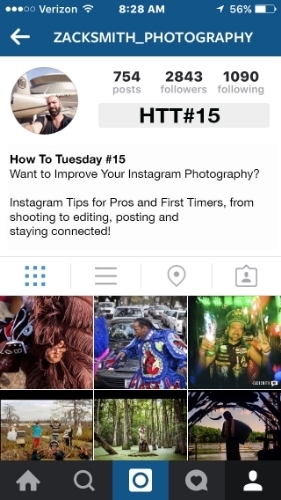 Instagram Tips for Photographers and First Timers! Let's connect now - CLICK to Follow Me on IG! https://www.instagram.com/zacksmith_photography/ - Get These Tips and More on my Instagram Feed! Let's Connect! I am sure by now you have all heard of Instagram. Photographers, if you are not on Instagram right now, that progress bar on your App download of Instagram should be inching closer to OPEN right NOW! Wether you use Instagram or not, you can't deny that it is the fastest growing photo sharing community out there. As of September 2015, Instagram has racked up over 400 million users surpassing Twitter (Source: CNBC), and is gaining steadily. The app has evolved over recent months from only showing your "square cropped" images to allowing 3rd party layout systems to integrate your natural rectangle compositions, collages, and multi-panel grid mosaics. Along with being able to write (not limited by characters like Twitter) about each photo, use hashtags, and Tag other photographers, Instagram is a must-have for photographers and visual story tellers who want to use the App as their "digital wall" and expand their online community. New "Layouts" 3rd Party App for Instagram! If you are already on Instagram, skip to the next step. If you are ready to download, there are a few key points I'd like to share to make your experience worthwhile. When you first join, use one of your main email addresses so that you can easily login, change your settings, and authorize the App. You can also easily start multiple Instagram accounts but you will have to use other email addresses. Choose a User Name that says something about you, one of your main projects, or something fun you will remember. Adding your website in the "Link in Profile" will allow your friends and followers to hyperlink to your website or anywhere you'd like to take them. This is a great way to bring potential clients and friends to your "home" or wherever your customized photography experience (or pitch) can continue. Think of Instagram as just another pathway to your website! Make sue you don't click PRIVATE ACCOUNT if you want people to see your work! Before you go off posting random shots of your burnt toast, breakfast, and the tips of your shoes all day...make a plan of how you want your Instagram Gallery to look to the viewer. If you want their experience to be a hodgpodge of images from your life, so be it. I like to use Instagram as a more calculated view of my many experiences in photography. I really to think about how the image will look when posted, what I can write about, and if two, or even three photos could tell the story better than just one. SHOOT FOR THE WALL! Using Rule of Thirds to simplify your Horizons! Leading Lines all over the CBD in New Orleans! All the rules you learned with your DSLR or point and shoot remain the same. Converging Lines/Leading Lines, Rule of Thirds, Negative Space - all apply here. If you take the time to set your horizons straight, watch your backgrounds and always have a subject...you're on your way to Instagram Glory! It doesn't matter what kind of phone you are using Instagram with, if you are composing photos from in-phone you must have GOOD LIGHT. Always have the sun AT YOUR BACK, meaning the sun is shining from behind you and illuminating where you are pointing the phone/camera. The more even the light is on your subject and background the better the photos will be. Shooting during the GOLDEN HOUR (see my most recent gallery!) with the sun setting low will get you some beautiful warm tones and even light over your scene. Harsh overhead mid-day sun will still produce hard shadows and squinting subjects. Once you've gotten a good composition and pressed the blue shutter button, your app gives you some handy editing options. Below you will see some FILTERS from "Clarendon" to "Moon" and others. If you click one, it sets that pre-set color, contrast and vignette on your photo. You can scroll all the way to right and MANAGE your Filters and even add new ones! Pressing the middle button "FLUX" in your Instagram editing screen will adjust contrast. With the small WRENCH tool on the right you can open a whole new set of Fine Tune editing features like: Adjust, Brightness, Contrast, Vignette, and more...experiment and have fun! - Snapseed, PhotoBlender, PhotoCandy, Edit.Lab, Cinemagraph, iWatermark, and Lightroom. WiFi connected cameras make it so easy to shoot with your DSLR or fancy point and shoot then easily upload to your phone, and then Instagram! I do this alot when I am shooting with my Canon 6D and my Canon G7x. I like to be able to use any lens or exposure setting I can dream of and not be limited by my iPhone lenses and exposure shortcomings. Once you get the image saved in your camera, you can then use your Instagram filters and 3rd party apps to enhance your photos even more! You can easily connect your Facebook and Twitter accounts to your Instagram feed and share directly to those accounts. This is a fast and easy way to let your friends on your other accounts know that you have something cool going on at your NEW Instagram account! Professional photographers like this feature so that they don't have to share the same photo three times on all of their accounts and can just click SHARE, and voila! If you don't quite fully understand what "hashtags" are..don't be embarrassed - none of us knew at some point. Now we know, and there you go. Using unique and both popular hashtags (all you do is press the # symbol before a word in your photo description) allows whatever app you are using (Twitter, Facebook etc) to collect and aggregate these tags and the photos they are associated with to one place for a collection. Unique hashtags allow you to locate images along the Instagram's history and you can just type in .... #neworleans and see what comes up. Giving your images descriptor hashtags can help others interested in what you do an easy way to find you..THUS helping you create a larger community. The more tools we have to connect us with other like minded or interesting image makers the better! We can all learn from each other and share our experiences through these applications. Join my Instagram feed to see how I use Hashtags! These are just a few tips to help you get started or improve your use of the wonderful Instagram app. The key word here is CONNECTIVITY...this app allows us to connect to others with our images. The image is paramount, the image is king. It's on the WALL to look at for a reason! GET OUT THERE AND SHOOT FOR THE WALL!